The U.S. Census is one of the most useful tools for research and marketing because it tells you how many people fit specific demographic profiles and where they live. It started out as a simple count of how many people live in each state in order to allocate congressional seats. But it has since become a rich source of insight, with information about Americans’ age, family composition, work status, income, education, housing, and more. While the Census provides basic tabulations and counts on its website, you can also query the data yourself to answer specific, customized questions that you are unable to find otherwise. In fact, using this data is so easy that Versta no longer uses the Census’ rather difficult and ever-changing “fact finder” features. We have downloaded the data along with a codebook, and use a statistics program to run specific queries and counts of anything we need. Want to know how many single mothers there are between the ages of 40 and 45, with four children living at home? We can tell you. 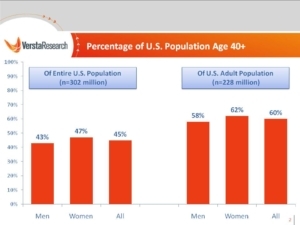 We recently had a client who was having a hard time finding the percentage of people in the U.S. age 40 and over. With the data from the census at our fingertips, it took just a few minutes to get this number, and ship off the answer to our client. The data (called the Public Use Microdata Sample, or PUMS) is available to anyone, for free. You’ll need a decent database, spreadsheet, or statistics program work to with it (we use SPSS). Or, to get the exact information you are looking for, contact Versta Research and we can help.